We sat down with Chris to find out more about his approach of adapting military concepts to the business world. Here’s what he had to say. Traction Tools: You started your career in the military. Tell me how your experience in the military has shaped your approach to business leadership. Chris Hallberg: When I was 17 I joined the Army National Guard Military Police. I was a citizen soldier, part-time. At 20 years of age, I took a job in the Minnesota Department of Corrections at their super-maximum security prison, which is five stories underground. So I did both things simultaneously. By the time I was 23, I was a sergeant in both organizations, leading people twice my age. When I bumped into the Entrepreneurial Operating System®, being a military guy and a systems guy, I was like a moth to the flame. Because the military is just one big system, and EOS® is a holistic, 360-degree operating system for your business. It just made complete sense to me. TT: What is the idea behind The Business Sergeant’s Field Manual? CH: It doesn’t talk a lot about the military, because there are Seal Team Six guys writing books. It’s not about persevering and surviving. It’s about the common-sense, just-get-it-done approach of the military. I created a business version of that, and the book takes military concepts and adapts them for business success. The subtitle is, Military-grade Business Execution Without the Yelling and Push-ups. It extracts the stuff that’s missing in the civilian world and then adapts it to business. TT: Is there something specific about the military that’s, at root, missing from the business world? CH: Absolutely. It’s one word: commitment. When you enlist for a six-year contract, if you don’t show up to work, the MPs are coming to get you and bring you to work. In the civilian world, there’s no MPs. So how do you maintain excellence in an environment where some people don’t care about it? The answer is, if you have an environment that protects what they value, they won’t leave for any amount of money! It’s hard for people to commit. But the V/TO™ in EOS states, this is what our vision is, and what it isn’t. If you’re not really charged up about it and what that looks like, go work somewhere else. TT: You start the book with an unexpected question: “Are you committed?” Isn’t it a given that business owners are committed to their own business? CH: Well, they made a commitment years ago, and what it looks like today could be vastly different from when they originally committed to it. The commitment can waver at different stages of the entrepreneurial journey, just like anything else in life. So I ask owners, Are you committed to leading other people? Are you interested in turning a profit? We might have to do some leadership stuff to get you there. If you’re an owner, you have this asset. If you no longer have the stomach or aptitude to lead other people, you should just go to the owner’s box and collect a monthly check, and allow the leadership team to do the work they need to do. Just because you own the company, that doesn’t entitle you to a job there—not if you’re looking at it as an investor, as a true entrepreneur. Owners aren’t entitled to anything if they want to have a maximum yield. TT: You also discuss the connection between leadership and accountability. You mention that accountability is a given in the military, but it’s not so common in business. Why do you think that is? CH: We’ve all experienced organizations where the service is less than legendary, such as public service jobs. Unless you forget to wear pants, or commit a felony, you’re not getting fired. You have tenure, or time and grade. In the military, the reason you’re accountable for your work is because it serves your unit, and the people around you. It’s good for the unit, it’s good for the people around you, and it’s good for you. It’s the difference between owning your work and putting your name on it, and just getting paid by the hour no matter how good or bad the work is. TT: You end your book with kind of a “non-business” chapter, in a sense. Why was it important to you to include this chapter? CH: It’s kind of a perspective thing. The book itself is 11 chapters of super high-level stuff, with 82 bite-size lessons. And chapter 11 is about taking care of Number One. And Number One isn’t necessarily you, it’s your health and the people who are the reason you go to work. Who is that for? Is it your family? What’s your higher power? So, now that you have all the lessons on running a successful company, the last chapter says don’t lose perspective on what you’re working for. Spend time with your children. Have some perspective. TT: One of the things that makes your field manual different from many other business books is the tools that you provide at the end of each chapter. How do you recommend people use this book? CH: First, it’s a perfect companion for EOS. The two go together like peas and carrots. The tools I’ve created are a great complement to EOS. You don’t need these tools to run on EOS, but they’ve been helpful to me as an entrepreneur, and they’re helpful to my clients. I also wanted to provide the tools for free to people who didn’t buy the book. You can go to my website at bizsgt.com, and get all the tools right there. Need a no-nonsense approach to running your business on EOS? 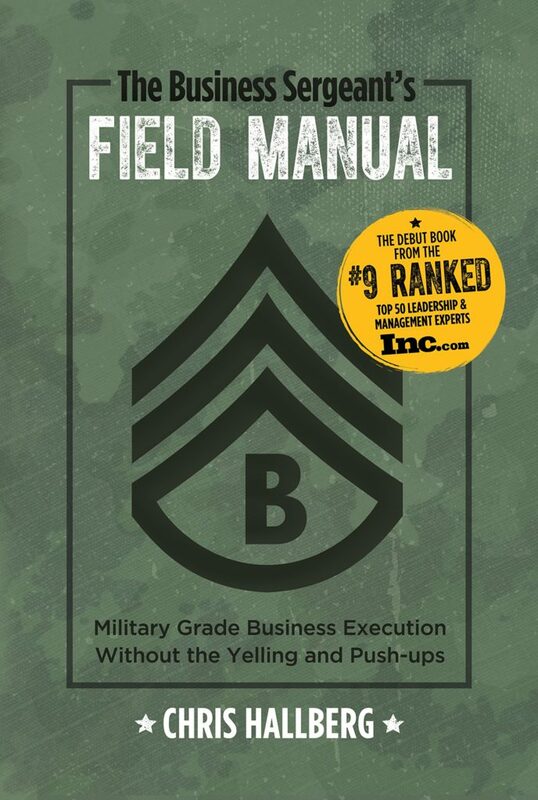 Get The Business Sergeant’s Field Manual and start working through it today! Looking for great software to run EOS? Discover how Traction Tools helps you productively manage EOS tools from Day One.